If you or your family members often deal with bloody noses, dry or irritated skin, chapped lips, allergies or asthma, chances are you could benefit from a humidifier in your home. Besides causing dry skin, dry air also makes it easier to catch colds and develop sinus or respiratory infections. Humidifiers aren’t just for newborn babies. They help everyone breathe better and they even help the structural integrity of your home. In this article, we’ll help you decide whether a humidifier is right for you, and then look at the best humidifiers on the market today. Humidifiers aren’t always needed to improve the air quality and health of your home, but in some cases they’re necessary, and in most cases they provide benefits. You can tell the humidity level is too low in your home if you’re having consistently dry skin, itchiness on your skin, eyes or throat, or irritation in your nasal passages. You’ll also feel the presence of static electricity in clothes and on carpet. Raising humidity levels with a humidifier will help make the air more comfortable for you. If you want to, you can use a hygrometer to measure the humidity level in your home. A level of humidity below 30 per cent is too dry. On the other hand, levels over 55 per cent can allow mould and bacteria to flourish, so it’s a good idea to keep a hygrometer in your home if you plan on getting a humidifier. If the humidity level of your home is around 35 to 45 per cent, you may want to consider using a humidifier. Ensuring your air maintains a healthy humidity level helps retain moisture in your skin, lips, throat and sinus passageways. Your nose depends on moisture to trap germs that enter when you breathe, which is why colds and flu can spread more easily in dry conditions. Also, if your wood furniture and flooring are exposed to large changes in humidity levels throughout the year, it can cause the wood to contract and expand excessively, damaging its appearance. Using a humidifier can help keep humidity levels steady when winter comes around. Besides using a humidifier, there are also other home devices you can use to improve the health of your indoor air, and each one offers its own unique benefits. Air conditioners improve indoor air quality by bringing fresh outdoor air into the home and filtering out large pollution particles. Their filters don’t pick up smaller pollutants like air purifiers do, but they provide an initial layer of protection against pollution. They remove moisture from the air, but using a humidifier can help offset the change in humidity. Air purifiers don’t alter the humidity level in your home, but they’re the best way to cleanse the air. They work by filtering the air, collecting airborne pollutants like bacteria, viruses, mould spores, chemical gases, smoke, dust and other allergens. Some air purifiers emit charged particles that neutralize pollutants. Oil diffusers emit water vapour into the air along with essential oils or fragrance oils you can add to the water reservoir. These oils typically damage humidifiers when placed in their reservoirs, so this is the option to go with if you want to add some fragrance along with the moisture you add to your air. What Should You Expect from a Quality Humidifier? When altering the humidity of your home, it’s important to keep an eye on its humidity levels. With a built-in hydrometer on your humidifier, you can always know the exact level and use your humidifier according to your ideal humidity level. Humidifiers that allow you to set your desired humidity level so that they shut off once that level is reached are even better because you don’t even have to monitor it. The longer your humidifier can operate without requiring you to add water to the reservoir, the less maintenance you have to put into it. Some humidifiers can run for longer than 24 hours without needing the water replaced, which means if you used it on an intermittent setting or for just a few hours a day, you could go several days at a time without refilling the device. Just like air conditioners, air purifiers and other devices for the home, humidifiers emit a level of white noise you have to get used to. However, some are quieter than others. If sound is an issue for you, make sure you find one that’s designed to operate quietly. Humidifiers are generally low-maintenance devices. However, you typically need to clean them on a regular basis to prevent mould, mildew, bacteria and other impurities aren’t building up inside them. With some high-quality humidifiers on the market, however, you can bypass the need for cleaning because there’s an internal wick filter that prevents this from happening. You may need to replace the filter periodically, but not near as frequently as you would have to clean a humidifier reservoir. Now that you know what to look for in a quality humidifier. It’s time for you to choose one for your home. 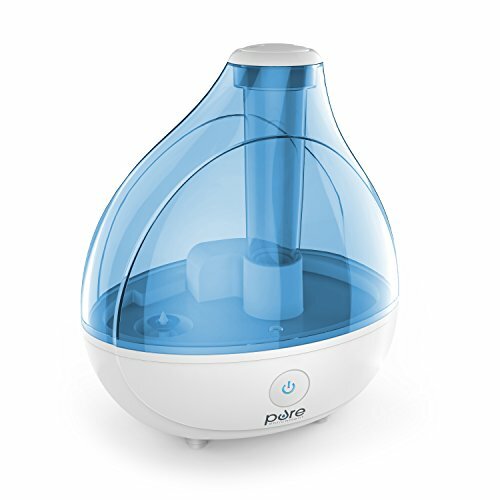 Here are some of the best humidifiers worth considering. The AIRCARE whole-house console humidifier increases humidity levels within a 3,600 square foot area, which is ideal if you’re dealing with house-wide dry air from central heating or air conditioning. Given that the average home in the U.S. is about 2,700 square feet, not everybody needs a humidifier with this capacity. If your home exceeds 3,600 square feet, however, you can easily move the AIRCARE humidifier around in your home, as it has wheels that make it easy to relocate. It requires minimal maintenance, as it can run for up to 36 hours without refilling, and the wick filter that collects mineral deposits can be soaked in vinegar and used again. Because this filter doesn’t trap pathogens to prevent bacteria, mould, mildew or fungi from building up, you still need to clean the humidifier periodically. The AIRCARE is also energy efficient, has a hydrometer and shuts off automatically once it’s reached your desired humidity level setting. The problem many users have with this large, heavy-duty humidifier is that it’s too loud, even when set to the lowest fan speed. If quiet operation is a priority for you, the VicTsing is a good choice. It operates at a sound level just under 32 decibels. By comparison, the average computer emits white noise at 40 decibels. 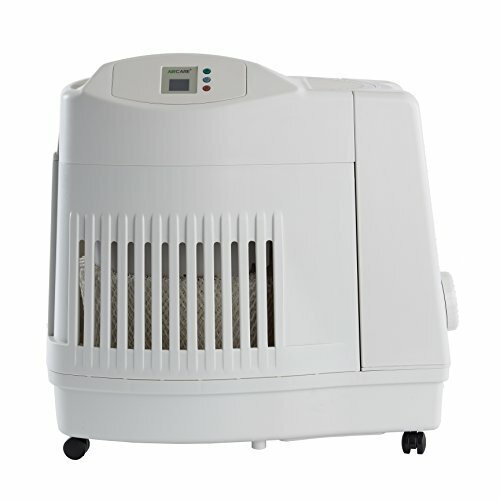 Its quiet operation along with its small size make this humidifier ideal for your bedroom or office. It’s cheaper than most humidifiers, but it does lack the bells and whistles of higher quality humidifiers, such as a built-in hydrometer and a filter to catch mineral deposits or neutralize pathogens. Because there’s no filter system, the manufacturer recommends cleaning it with vinegar once a week. In addition to this maintenance, it also needs refilling frequently if you use it all day, because it runs for less than 24 hours. If you’re willing to spend more money on a humidifier, you might consider a higher quality unit, but if you want to spend as little as possible, this one will definitely get you by. It’s more likely to have the motor burn out or to develop leaks, but it has a 1-year warranty so you can have it replaced if it malfunctions. 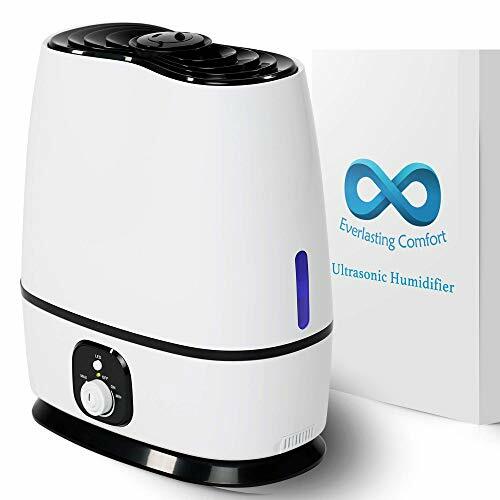 The Ultrasonic cool mist humidifier provides economic value if you’re interested in getting an oil diffuser as well as a humidifier. With a built-in oil diffuser, you can add drops of essential oils or fragrance oils to its diffuser tray and instantly freshen up the air in your home. 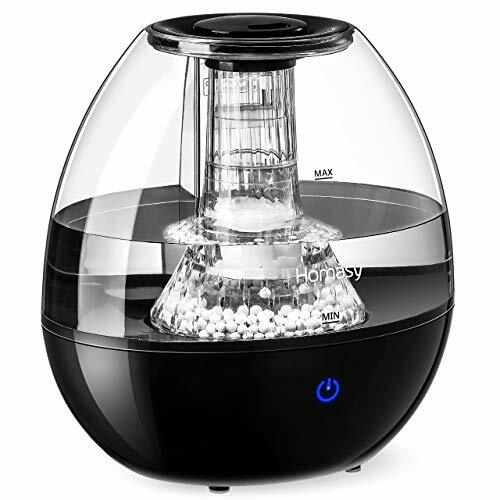 The Ultrasonic humidifier has auto-rotating nozzles to emit mist 360 degrees, humidifying areas up to 400 square feet. The let-down with this diffuser is that there’s no filter for collecting mineral deposits, and the manufacturer warns that without using distilled water, the device can emit harmful white dust. While it’s a drag to have to buy water or distill tap water to fill up the reservoir, the good news is that the reservoir doesn’t need refilling too often. It holds 6 litres of water and can run up to 50 hours between refills. 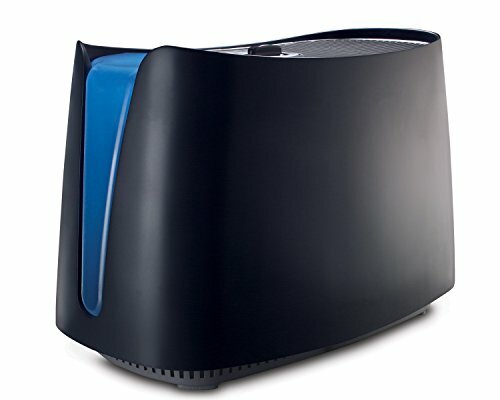 The Honeywell humidifier is black and adds a sleek appearance to your office or home. Its winning feature, however, is UV technology that kills 99.9 per cent of waterborne pathogens in the device. It also has a wick filter that ensures no mineral buildup from tap water causes white dust to enter your air. Unfortunately, it can definitely run into problems after months and years of use, because the UV light and the fan have been known to burn out, and the warranty only applies to units that are defective to begin with. 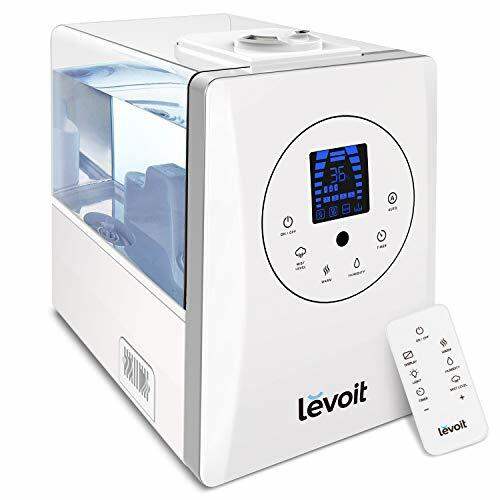 Like the Ultrasonic humidifier, the LEVOIT has a 6-litre capacity and is designed to humidify larger spaces. It costs just a little bit more than the Honeywell humidifier, but it’s built with better materials and has a better warranty. Sure enough, few buyers have reported malfunctions with this unit. 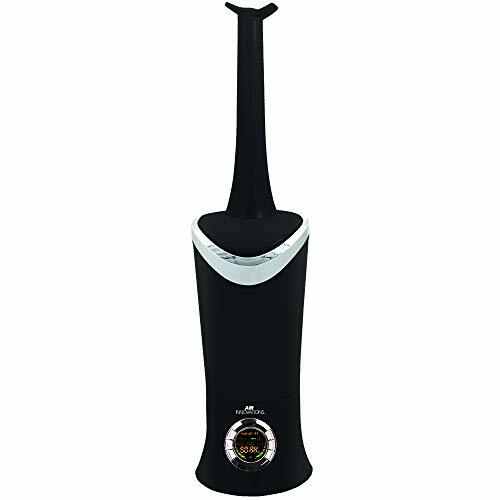 Also, like the Ultrasonic, it has a built-in diffuser for essential oils and other fragrance oils. It features an auto mode that ensures your humidity levels stay within a healthy range. It comes with a remote control you can use to change the settings, and there’s a built-in hydrometer so you can read the humidity level of your home. Unlike other humidifiers, it has temperature control, so you can choose whether you want the device to emit cool mist or warm mist. This unit operates quietly, is surprisingly lightweight and easy to move, and it has all the bells and whistles. If all you need is a simple humidifier to use when you or a family member has a cold, you might not want to invest the money. 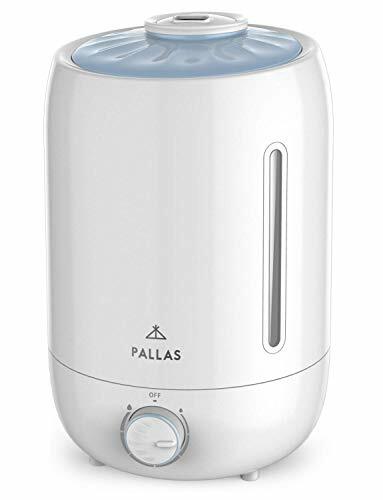 The Pallas humidifier is designed to humidify large areas with minimal maintenance. It can run continuously for up to 90 hours before needing a refill. It has an activated carbon filter to ensure the water stays pure and clear of microbes. It generates mist using ultrasonic waves, which atomize water into ultrafine water particles and allow the device to operate almost silently. Unfortunately, there have been several cases of leaking units that create a puddle of water beneath them with each use. As long as your Pallas unit doesn’t leak, it’s a high-value purchase considering the price. The digital humidifier from Air Innovations provides many settings that enable you to use it with minimal monitoring and maintenance. You can set the humidity level you’d like your home to reach and let the humidifier turn on and off automatically in order to maintain that humidity level. You can also program the humidifier to operate on a timer. It has a 6-litre capacity and operates for up to 96 hours continuously. Designed to humidify up to 600 square feet, it’s ideal for large rooms or small apartments. It has a uniquely made nozzle that dispenses mist in two directions and it can rotate to ensure mist is dispersed evenly throughout your home. The water tank is antibacterial, and it has a permanent ceramic filter for collecting mineral deposits. You also get an essential oil tray so you can safely use the humidifier as a diffuser. You’ll pay a little more for this humidifier, but you’re getting all the bells and whistles. Its downfall is that its filtering system is inadequate, and the unit is difficult to clean. The manufacturer describes the water tank as “antibacterial,” but many users report the growth of mould and slime in the tank. The Homasy humidifier is the easiest humidifier to refill, as all you need to do is pour water directly into the top of it. It can only run for 10 hours as the most at a time before needing refilling, but it’s designed to be small to fit a bedroom or office. It uses ultrasonic technology to disperse mist, which makes it quiet enough for sleep. It has a stone filter that purifies the water and never needs replacement. It’s a simple humidifier without the extra features like a hydrometer or programmable settings. 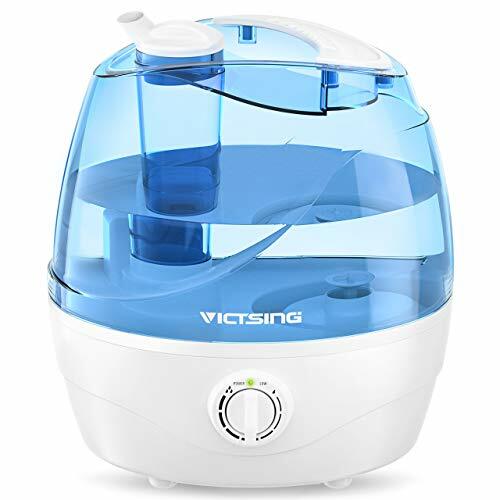 You can save money if that’s all you need, but keep in mind that this humidifier is made with cheaper plastic, and even though it has a filter, it needs frequent cleaning to prevent mildew and mould growth. The Fancii personal mini humidifier is a compact device you can connect to the top of a water bottle for instant humidifying mist wherever you are. Its portability is what makes this product so unique, as you can throw it in your bag, bring it to your office desk and then come home with it for use at your bedside through the night. It’s battery-operated for maximal portability, but you can also plug it in to save the batteries. With ultrasonic technology, it’s quiet and hygienic. The problem with this mini humidifier is that it may not be able to combat severely dry air in the winter. It helps to improve air quality in your immediate space like at your desk or nightstand. However, it only emits a tiny bit of mist and can’t make much of a difference for an entire room. 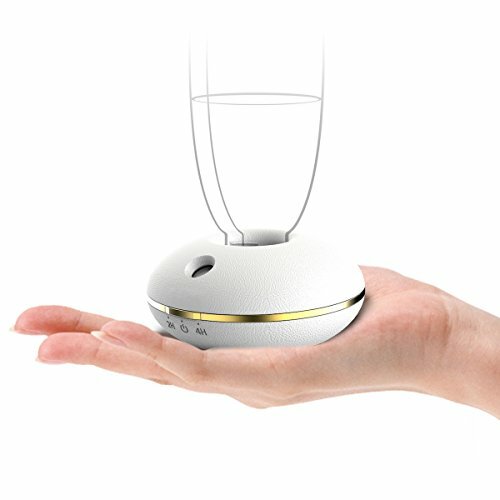 The MistAire from Pure Enrichment is an ultrasonic humidifier for small and medium-sized rooms. Its price is economical, but the unit lacks any sort of filter. It comes with a disk cleaning brush for clearing out any buildup, and the manufacturer recommends using distilled water. It has a soft-glowing night light you can turn on or off. The settings are simple, with low and high mist flow options. The major downside is its lack of a filter and needing to be cleaned frequently. If too much gunk builds up, cleaning it can quickly become more and more difficult. Our favourite humidifier is the LEVOIT because of its large capacity, range of important features and excellent track record of working effectively throughout its long lifespan. The LEVOIT is an expensive but practical option because it’s less likely to break or malfunction, and it gets the job done accurately with its hydrometer and programmable settings. If you’re affected by dryness or just want to ensure the humidity level in your home is accurately maintained, a quality humidifier is a good investment. It adds moisture to your skin and air passages, improving your breathing and reducing the spread of germs. Great humidifiers require less maintenance and last longer, so opting for a top-of-the-line model is worthwhile.